Join us for a week-long escape rafting the best river in Central America, exploring the unique wildlife of the rainforest canopy, and witnessing the turtle nesting miracle in Tortuguero National Park. What could be a finer juxtaposition than mixing the pulse-quickening thrill of a world-class whitewater river with the quiet awe of one of the greatest natural phenomena on Earth—the annual turtle nesting on the Caribbean coast of Costa Rica? You’ll experience the best of super-natural Costa Rica on this tropical adventure, while based out of two of Central America’s most legendary eco-lodges. Arrive at Juan Santamaría International Airport, register with immigration and go through the standard customs check. When you are exiting the building, look for your transfer guide in a bright orange or yellow shirt holding a sign with OARS on it. He or she will take you to our hotel. Details of when and where to meet the next morning will be provided by your transfer guide, but it’s usually 7:00 AM in the hotel lobby for breakfast. If you arrive ahead of day 1, look for this information to be provided via message at the hotel reception. We arrive at the unique Rios Tropicales Lodge where we can spend the afternoon relaxing, hiking or soaking in the natural pools by the river. After settling-in to your room, come on down to the open-air dining area where the guides will have prepared fresh appetizers and the guest-acclaimed famous “jungle punch.” As the sun dips behind the hills and the twilight fades, we will be treated to a delicious, freshly prepared dinner. Nestled in the jungle on a 2,000-acre private reserve above the Pacuare Gorge, the Rios Tropicales Lodge offers very comfortable accommodations in “Cabecar Indian” style bungalows with spacious rooms, private bathrooms and hot water showers provided by the self-sufficient mini-hydro-plant that generates the electricity. Beautiful tropical gardens frame the native wood structures. The lodge is built as a sustainable eco-lodge—including the building materials, waste management system, recycling practices and the clean, renewable energy that powers the entire facility. The lodge is a great starting place to explore the surrounding rainforest on self-guided trails or with a naturalist guide, relax in serene water pools or in a hammock overlooking the river, fly through the canopy on the zip-line tour or watch the myriad species of birds and other animals in this wonderful location. Did we also mention sipping jungle punch and dining by candlelight with a delicious dinner? Wake up to the beauty of the light through the forest, the sound of toucans and the smell of coffee. This day is designed to enjoy the lodge and its natural surroundings. Here you will have the unique opportunity to experience the wonders of the rainforest canopy on the zip line course. The distinctive platforms blend in seamlessly with the natural surroundings, giving you an amazing perspective of life in the roof of the jungle. After a hearty breakfast and loading the rafts, we’ll prepare to paddle downriver through the Class III-IV Pacuare Gorge, past gushing waterfalls, serene pools and pounding rapids. A quick stop by the riverside allows you to explore a waterfall and pool. An adrenaline-packed morning running rapids like Upper and Lower Huacas, Cimarron, Dos Montañas and many more will have you cheering ecstatically. Our river journey ends with lunch at the Ríos Tropicales Operations Center, where showers and changing rooms are available. Then, we’ll board our private minivan and depart for the one-and-a-half hour drive to the Caño Blanco dock where we’ll board a boat for the 1-hour transfer to Tortuguero. These boats are sleek and fast and fun to ride in! After checking in to your room, explore the beautiful gardens before dinner is served. The sounds of the surrounding rainforest, full of wildlife, will welcome you to this day. If you’re interested, wake early and join our naturalist-guide for a sunrise nature walk in the surrounding gardens. After breakfast, we’ll board a motorboat and cruise the park’s canals and lagoons before we arrive to a remote canal. Here we’ll launch our kayaks and enjoy a leisurely paddle, exploring where motorboats cannot go and where wildlife is most abundant. You’ll find yourself blending in with the scenery as you paddle a kayak slowly through the water, immersed in a world where the forest merges with the rivers. This is a guided tour and takes approximately three hours. This evening we’ll gather again, in hopes of witnessing an Atlantic Green Sea Turtle nesting on a nearby stretch of beach. Come dressed in dark clothing so as not to be visible when walking the beach toward a nesting turtle. Depending on our route through the waterways of Tortuguero National Park, we may stop to take-in the sights as many creatures make their way home for the night and others begin to wake and forage. Once at the beach, our group waits for the park service trackers who will radio our guide to indicate where a mother turtle has been spotted. Once located, we get to stand a few feet from the 300 pound turtle while she lays 80-100 eggs, covers up her nest, perhaps digs a false nest to throw off predators, and after more than an hour, returns to the sea. While our primary objective is to witness the nesting process of the Atlantic Green Sea Turtle, we will also have the opportunity to observe the stars in the Caribbean sky, the bioluminescence on the waves, and if we’re really lucky we may see a sign of jaguar coming to the beach, also in search of a turtle. It’s not unusual to find their tracks in the sand. Early this morning a boat takes us across the river to the Tortuguero airstrip where we will board a chartered flight to the regional airfield in San Jose, Tobias Bolaños Airport. Upon arrival, we will transfer by vehicle to San Jose’s international airport for return flights home, domestic flights or to a car rental office if your travels continue in Costa Rica. Pura Vida! Talk to an OARS adventure specialist about the many options to extend your stay in Costa Rica. For travelers arriving on day 1, an OARS representative will meet you at Juan Santamaría International Airport (SJO) near San Jose and provide a transfer to our hotel. Travelers arriving into Costa Rica before day 1 of your trip can have their transfer arranged by OARS for an additional cost. The group will meet the next morning (itinerary day 2) for breakfast. *Note that your transfer driver may not be familiar with specific details of the OARS trip itinerary. 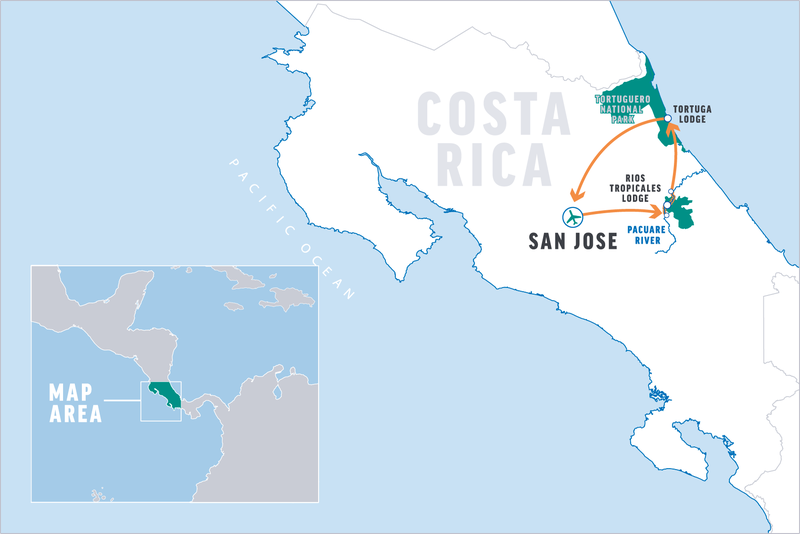 From the United States, these are some of the carriers offering services to Costa Rica: American, Delta, JetBlue, Spirit, United Airlines, US Airways, Copa, Aeromexico, TACA and Air Canada. On the final day of your trip, we will transfer across the river from Tortuga Lodge and board a chartered flight back to Tobias Bolaños Airport, near San Jose. Upon arrival, you will be transferred to the international airport for outbound flights (including domestic flights), a car rental office, or to a nearby hotel. Schedule your departing flight from SJO no earlier than 1:00 PM. To expedite your departure experience, we have included the Costa Rica departure tax in the trip price. This trip includes hotel and lodge accommodation for each of the five nights. If you plan to arrive early or stay late, please contact our office if you would like assistance in booking pre- or post-trip accommodation at one of our hotels or lodges. We recommend you make reservations well in advance in order to guarantee lodging. Pre- and post-trip lodging is not included in the trip cost. Accommodation at hotels other than the ones we work with can be arranged directly with that establishment. If you don’t have a passport, apply for one immediately because the process can be lengthy. If you do have a passport, find it and check the expiration date to see that it is valid through the duration of your planned visit to Costa Rica. Make a photocopy of the photo page of your passport and carry it separately from your passport. It is a good idea to leave a copy with your emergency contact at home. We request that you send us a copy to keep on file for emergencies during your trip. If your passport is lost or stolen, a photocopy will help the local consulate speed up authorization for replacement. Also check your passport for blank pages. If you do not have at least two blank pages in your passport, we recommend that you apply to have extra pages added. Do not pack your passport in your checked luggage. You may be asked for your papers at various times during the trip. If you are carrying a customs form, please keep it in a safe place at all times. We recommend carrying it separate from your passport because you often must submit the passport at hotels, where reception clerks can easily lose the form. Visas are not required for U.S. or Canadian citizens to enter Costa Rica if your planned visit is for 90 days or less. For citizens of other countries, please check with the Costa Rican consulate. The Pacuare River, or Rio Pacuare, has been named one of the top ten rivers in the world by National Geographic. Winding through lush, primary rainforest, the Rio Pacuare offers unparalleled views of Costa Rican wildlife and natural beauty. The rainforest that surrounds the river is home to exotic species such as jaguars, monkeys, ocelots and a great number of birds including toucans, king fishers, herons, hawks, osprey, egrets and oriels. Add exciting Class III and IV whitewater rafting on warm, celadon-colored water and you can expect a tropical adventure packed with rich experiences that will offer memories to last a lifetime. The essence of Tortuguero is slow-moving tropical rivers & canals. Everything about Tortuguero is defined by the rivers. They are the essential roads and soul of Tortuguero. Located on the Caribbean coast, Tortuguero National Park has incredible biological variety including rainforest, swamps, beaches and lagoons. The park supports hundreds of species of trees and thousands of plant species which in turn attract an amazing number of birds, including kingfishers, toucans, blue herons, peacocks and various parrots. The forests are home to jaguars, three- and two-toed sloths, ant eaters, reptiles and three of Costa Rica’s four species of monkey, while the rivers house sensitive populations of manatees, caimans and crocodiles. The beaches in the reserve are key nesting grounds for endangered sea turtles such as Hawksbill, Loggerheads, Green and Leatherbacks. As part of a small group along with a naturalist, we hope to witness a turtle nesting on a remote beach. It’s a fascinating part of the turtle’s lifetime journey, which started many years ago when she broke out of her own egg, climbed up through the warm sand, and stumbled down to the ocean shore—through a gauntlet of predators. She is the one in 10,000 who survived. She roamed for all those years through thousands of miles of ocean. Now she’s much larger, protected by her shell and a long life of adventures that made her strong and safe. Amazingly, through her ability to sense the earth’s magnetic field, she has returned to the very beach where she was born 30 years ago. She’ll emerge from the ocean. You’ll sit with her as she digs her nest and lays her 80–100 eggs. She will then laboriously cover the nest, perhaps digging a false nest to throw off predators before finally returning to the ocean. You will be there at the perfect time, at the perfect place, on that isolated beach, to meet her and grasp something about eternity. Costa Rica is known for its varied cuisine. You will be able to experience a variety of foods during your stay. Fresh fruit and seafood are a special delight. All meals, beginning with breakfast on day 2 through breakfast on day 6, are included in your trip. We need to know as soon as possible about any dietary restrictions we must consider in planning your trip. If you have additional food allergies or necessary restrictions, we will do our best to accommodate your needs. Beyond our standard menu, we can provide options for vegetarian, vegan and many allergy-restricted diets. However, we cannot always provide the same diversity or sophistication for restricted diets as we do for our regular menu. Similarly, certain allergen-free snack foods are difficult or impossible to source in our locations, so feel free to bring your own favorite snacks to supplement our provisions. Alcoholic beverages are not included in the cost of your Costa Rica adventure but are readily available at your hotel in San Jose and at the lodges. The local authorities state that the drinking water in Costa Rica is perfectly potable; however we recommend that you stick to the bottled variety wherever possible to play it safe. Costa Rica is by no means Mexico (where Montezuma’s revenge has become the stuff of tourist legends) but there may be bacteria in the water in some areas that disagrees with your system. As such, we simply suggest that you be cautious of what you eat and drink, as an upset stomach can be a burden during travels. Costa Rica’s electricity supply is 110 V AC at 60 Hz— the same as in the USA. Outlets are also the same, and accept flat, two-pronged plugs like the kind used in the USA. Few outlets accept a grounding prong, so you may need an adaptor to convert a three-prong device to two prongs. Both lodges, along the river and at Tortuguero, provide electricity 24 hours a day. If you’re an avid photographer, we recommend bringing a waterproof digital SLR camera that can be used on land and at appropriate river locations. Please bring a small bag, preferably waterproof, to hold your camera and other items you might want during the day when rafting. To further protect your camera you may wish to place it in a zip-lock bag or special waterproof camera case. We also recommend padding it with a towel or clothing. We strongly recommend you take out a rider on your homeowner’s policy to cover your camera—especially if it’s fine equipment. If you are planning to bring a digital camera, don’t forget extra media cards, batteries, etc. Disposable waterproof and panorama cameras are also a fun option. The use of electronic devices, especially music players and flying drones, on your trip may represent an intrusion into the wilderness experience of your fellow travelers. We ask that you be mindful of the impacts to others and respect the wilderness nature of the trip. Please bring headphones if you intend to listen to music during the trip and leave your drone at home. Many of our guests travel with their smartphone even though there is often limited cell service. On a trip like this, there is always the risk of water damage to smartphones and other electronic devices, even when they are stowed in a dry bag. If you intend to take your phone with you on the river, consider investing in a small, waterproof container just for your phone. While at our hotel in San Jose, internet is available and cell phone reception is good. During our two nights at the river lodge, there is no internet service and no cell phone reception. The lodge does have radio communication for emergencies. While at Tortuga Lodge, internet is available and cell phone reception can be found in limited locations. In the cloud and rainforest areas this trip will visit, the weather is considered ‘spring year around’ with average temperatures in the high 80s to low 60s. It can rain at any time in Costa Rica (there is a lot of rainforest) and rain gear is a must! Guests are also advised to bring a warm layer for evenings, particularly in San Jose. Humidity can be expected throughout the region. Elevation ranges from 0 to 3845 ft (the highest point is the city of San Jose). You may want to check one week prior to your trip for an up-to-date weather forecast. We recommend you check the following web site: www.wunderground.com. Look up San Jose as the area. The pace of life in Costa Rica is quite different from what you are accustomed to—it’s slower. You can try to fight it, but if you do, you might as well go home. Try to understand, enjoy and make the most of the “tranquilo” pace. Even if we could achieve an industrialized world pace, you would lose an important part of the experience of being in Costa Rica. Slow down, learn, and enjoy. Costa Rica corresponds to U.S. Mountain Time when the U.S. is in daylight savings time, and U.S. Central Time during winter months. Costa Rica does not observe daylight savings time. The Costa Rican Colon, or CRC, is the official currency of Costa Rica. U.S. dollars are widely accepted and can be obtained at ATMs. If you want to change currency, an easy place to purchase Colons is at our hotel in San Jose. We suggest you bring U.S. dollars in small notes, such as $1, $5 and $10 dollar bills, as larger notes may not be accepted. Cash is also useful for tipping. Please note that as a general rule, foreign bills (U.S. dollars for instance) with the slightest tear are often not accepted, so make sure your bills are in good condition. Only well-known types of traveler’s checks (American Express) or U.S. currency can be exchanged in Costa Rica. Major credit cards are generally accepted at hotels and shops. The Rios Tropicales Lodge (nights 2 and 3) and the Tortuga Lodge (nights 4 and 5) both accept credit cards. However, cash is useful if you visit remote places where you might have difficulty exchanging traveler checks or paying with credit cards. In San Jose, most of the major banks have 24-hour ATMs accepting a variety of cards. ATMs outside of San Jose are either hard to find or often do not work. There is an ATM machine at the San Jose International Airport. Spanish is the official language of Costa Rica. Most of those you come in contact with—at hotels, lodges and tourist sites—will speak English. Laundry service is available at Tortuga Lodge. Before dropping any laundry check for turn-around times. We recommend lightweight, quick drying articles of clothing that can air dry. Bring plastic bags to keep wet & dirty items separate from clean. Although we do not require any immunizations to participate in this adventure, it is important that you be current on several standard immunizations and that you check with your physician prior to departure. The CDC also is a good resource for recommendations pertaining to international travel immunizations. During the day—Start with a swimwear and a light-weight shirt as a base layer. Additional layers for sun protection or insulation can be added and subtracted depending on the weather and temperature. Lightweight synthetic or merino wool layers that wick moisture may be desirable if temps are cool. Evening wear—After a long active day, you may want to refresh and change into clean & dry comfortable clothing. Soft, loose-fitting shorts or pants, t-shirts, etc. will allow you to truly relax in the evening. Many women find sarongs or a cotton dress to be a nice change. Turtle nesting tour—Bring a dark (black or similar) outfit, consisting of shorts or pants and a shirt. Bright clothing is not allowed on the beach when viewing the turtles. During the day—For daily wear in the raft, kayaks and on shore, we recommend an amphibious closed-two shoe or river sandals with a secure ankle strap, as Velcro tends to clog with the fine tropical sand. These shoes will be wet much of the time. Make sure you get good-grip, no-slip soles. Some people prefer to wear river sandals in the boat and on wet hikes, and cushioned-soled athletic shoes for longer hikes. We highly recommend closed-toe shoes for the zip line. For around the lodges, flip-flops are perfect. Find professional-grade options made by Chaco®, the official footwear sponsor of OARS guides. Evening wear—The lightweight athletic shoes or light hikers you may bring for hiking can double as your evening shoes. It’s nice to put on dry socks and shoes after a day on the water. Flip-flops or sandals are great. Wide-brimmed hats are a good choice for sun protection and rain. A ball cap or visor may fit under your helmet, which is required attire when whitewater rafting. Rain gear protects you from rain, wind and the splash of the rapids. It is one of the essential items that all passengers should have no matter what time of year you are traveling. Look for a jacket that is 100% waterproof, not just water resistant, with secure closures around your head, neck and wrists. Do not bring a rain poncho as it cannot be worn under your PFD. Rain pants are not necessary. Protecting yourself from the sun should be taken very seriously. A hat, sunscreen, lip balm and sunglasses are a must. In many cases, a long-sleeve shirt is the best method for preventing sunburn on your upper body. Light-weight long pants may also be appropriate to protect your legs. Be sure to bring a good hat that offers full coverage, such as a wide-brimmed hat. Women may prefer to bring a sarong or a piece of fabric to be used as a cover up. There are two scenarios to keep in mind: packing for the river and packing for Tortuguero. Both have limitations that may require you divide your belongings into two bags – one for taking with you and one for storage. For this reason, please travel with an empty duffel bag, large stuff sac, or similar. For the river: personal gear you’d like during the two nights/three days will be packed into large, shared dry bags at the start of the river trip and carried downstream in the rafts. Therefore, the empty bag you bring will have only what you need for rafting and our day & nights at the Rios Tropicales Lodge. Your travel luggage won’t fit into the shared dry bags, so it and any of your belongings not needed will be kept by our staff and returned to you before going to Tortuguero on day 4. Going to Tortuguero: how you pack is important because of luggage restrictions on the charter flight from Tortuguero back to San Jose on day 6. The total weight of your baggage must be no more than 30 lbs. If all your personal items and travel luggage exceed 30 lbs, use your travel luggage or the extra bag again to bring only what you need to Tortuguero. Your other bag, with any gear not needed, will be kept by our staff and returned to you upon return to San Jose on day 6. On the river and while at Tortuguero, bring clothes that are appropriate for getting wet. We recommend swim shorts, t-shirts, long-sleeved sun shirts and either an amphibious shoe or sandals with a secure ankle strap. Bring along a hat, sunscreen, sunglasses (with strap) and a camera (waterproof or in a waterproof case). Plan to wear your river clothes the day we leave San Jose for the river (day 2). You can wear the same or similar clothes both days on the river. Lodge clothing may consist of evening wear such as shorts or pants, shirt and a lightweight warm top. Consider a second pair of sandals or lightweight shoes for around the lodge. Gear for the zip line canopy tour and hikes can include lightweight shorts or pants, shirt, rain jacket and closed-toe footwear suitable for an uphill hike. For the turtle nesting experience, be sure to pack dark shorts or pants and a dark shirt for the night walk, as bright-colored clothing is not allowed on the beach when turtles are nesting. For items left behind for storage, consider bringing plastic bags to keep dirty clothes separate from clean clothes. Avoid leaving wet clothes behind with our staff to hold, as they may mildew and result in stains or ruined clothing. We recommend that you leave valuables, such as jewelry, at home. For personal items like passports, wallets and cell phones, we recommend keeping them in a waterproof case (zip-lock bag) with your personal items that will travel by raft to the river lodge. When traveling to Tortuguero, you can keep these items on your person. Guests often ask whether gratuities are appropriate and in what amount. “Thank you” is always enough to put a smile on the faces of your guides and staff, but tipping is one of the many ways to reward them for their extra efforts. Because this adventure consists of several components with specific staff, we have created a list to assist you with extending a gratuity to the people who make your trip more enjoyable. You’ll want to plan ahead and have cash – either US Dollars or Costa Rican Colon. Under most circumstances, if you are of an adventurous spirit and in reasonably good health, you should have no problem enjoying an OARS. International People with medical conditions, including pregnancy, should have a physician’s approval before taking an adventure travel trip. O.A.R.S. International, Inc., Rios Tropicales, and cooperating agencies act only in the capacity of agent for the participants in all matters relating to transportation and/or all other related travel services, and assume no responsibility however caused for injury, loss or damage to person or property in connection with any service, including but not limited to that resulting directly or indirectly from acts of God, detention, annoyance, delays and expenses arising from quarantine, strikes, theft, pilferage, force majeure, failure of any means of conveyance to arrive or depart as scheduled, civil disturbances, government restrictions or regulations, and discrepancies or change in transit over which it has no control. Reasonable changes in itinerary may be made where deemed advisable for the comfort and well being of the participants, including cancellation due to water fluctuation, insufficient bookings (this trip requires a minimum of 6 guests), and other factors. There is risk in whitewater rafting, particularly during high-water conditions. Rafts, dories and kayaks do capsize. You could be swept overboard. Your guide will make every attempt to assist, but you must be strong and agile enough to “self-help” and “float-it-out” without further endangering yourself or others. We reserve the right not to accept passengers weighing more than 260 pounds or with a waist/chest size exceeding 56 inches. We may decide, at any time, to exclude any person or group for any reason we feel is related to the safety of our trips. We are experienced at accommodating people with various disabilities. Please give us an opportunity to make you feel welcome. We need to discuss any special requirements ahead of time. On advancement of deposit the depositor agrees to be bound by the above recited terms and conditions. Prices subject to change without notice. Costa Rica Expeditions and Rios Tropicales, travel partners of OARS. International, are the operators of this adventure. Their staff members are the very best and will strive to ensure your complete satisfaction.